The Attack on Kit-Han-Ne, Kittanning, Pennsylvania, September 8, 1756. 2006 by Larry A. Smail. 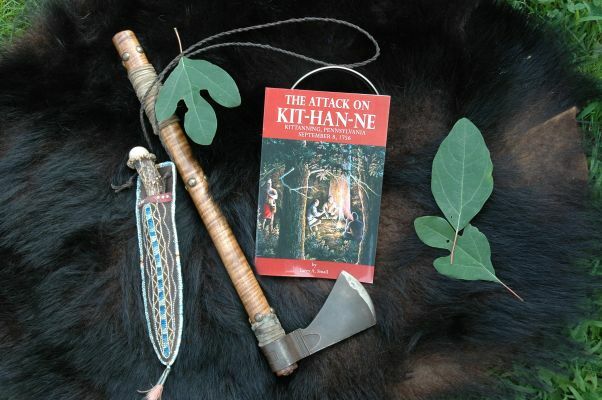 Richly illustrated by its talented author, “The Attack on Kit-Han-Ne” recounts the events surounding the famous battle at what is now Kittanning, Pennsylvania, on September 8, 1756. In an easy-to-read style, this work gives the reader a concise and clear understanding of the facinating history and struggles of the area leading up to General Armstrong’s victory over the Delaware Indians. Highlights include: the French descending the Allegheny River; English demands on the French; Braddock’s defeat; the Kit-Han-Ne war chiefs; the burning of Fort Granville; Blanket Hill attack, and Indian raids in the Kittanning area. This work contains a chronological table and over twenty-five illustrations and photos. It is 86 pages, 5.5″ by 8.5″, and soft cover. The price is $9.95. ~just wanted to let you know that I read your book and REALLY enjoyed it!! I had no idea how much Native American History there was around Kittanning. My guess is that~since I really am historically illiterate~that there is a lot of history about which I need to learn. ~I hope others will be intrigued by the title and purchase the book! !